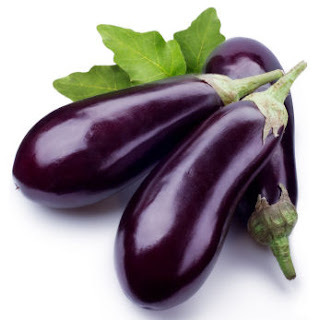 The nightshade Solanum melongena, also known as the aubergine, brinjal eggplant, eggplant, melongene, brinjal or guinea squash, is a member of the plant family Solanaceae. The plant bears a fruit of the same name, commonly used in cooking. 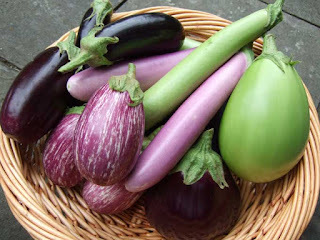 As a nightshade, it is closely related to the tomato and potato. It was domesticated in India from the species S. incanum. S. melongena is a delicate, tropical perennial often cultivated as an annual in temperate climates. It grows 40 to 150 cm (16 to 57 in) tall, with large, coarsely lobed leaves that are 10 to 20 cm (4–8 in) long and 5 to 10 cm (2–4 in) broad. Semiwild types can grow much larger, to 225 cm (7 ft) with large leaves over 30 cm (12 in) long and 15 cm (6 in) broad. The stem is often spiny. The flower is white to purple, with a five-lobed corolla and yellow stamens. 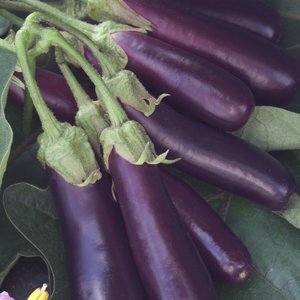 The fruit is fleshy, has a meaty texture. It is less than 3 cm (1.2 in) in diameter on wild plants, but much larger in cultivated forms.